Our fun activity of pick-it-yourself apples at the New York apple orchard resulted in bringing home about 30 pounds of apples. That is alot of fresh sliced apple snacks. Plus these varieties of apples (Empire, Golden Delicious and Ida Red) are very tart. I’m not a person to waste anything and so that sent me searching for recipes to use all these apples. Warning — you may not be able to stop eating this apple pie. 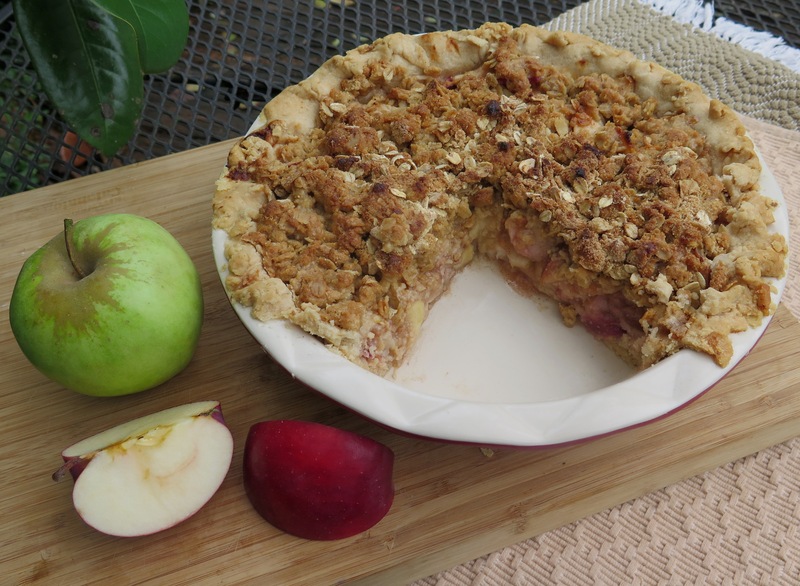 There is something irresistible about the combination of a flaky pie crust, an aromatic (but not too sweet) apple filling and a crunchy oatmeal crumb topping. Autumn is the time of year to find varieties of apples at farmer’s markets and produce stands that don’t appear at other times of the year.